This is an open call for feedback on a training I created with Udutu - an online course authoring tool. 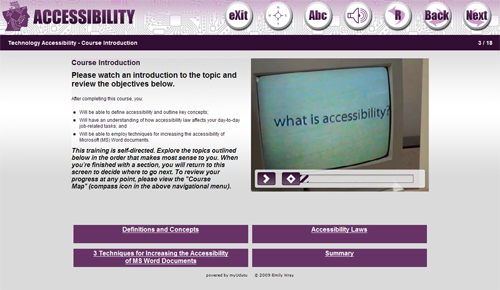 The lesson was designed to foster a deeper awareness of technology accessibility issues among State of Florida employees and to demonstrate several techniques for increasing the accessibility of Microsoft Word documents. Technology accessibility is the subject of my thesis and I shall live and breathe it for the next two months! For all you instructional designers out there... this module is SCORM 2004 compliant. For those of you unfamiliar with SCORM (Sharable Content Object Reference Model)... It's a compilation of technical standards and guidelines for the development of e-learning curriculum. This training is also available via the UdutuLearn Facebook application.